On April 16th and 17th, join Dubspot Instructors Dan FreeMan and Max Wild for a special International Ableton Live workshop with our friends at Ableton in Berlin. Check out our Ableton Live Music Production Program, classes start soon. Enroll Now! 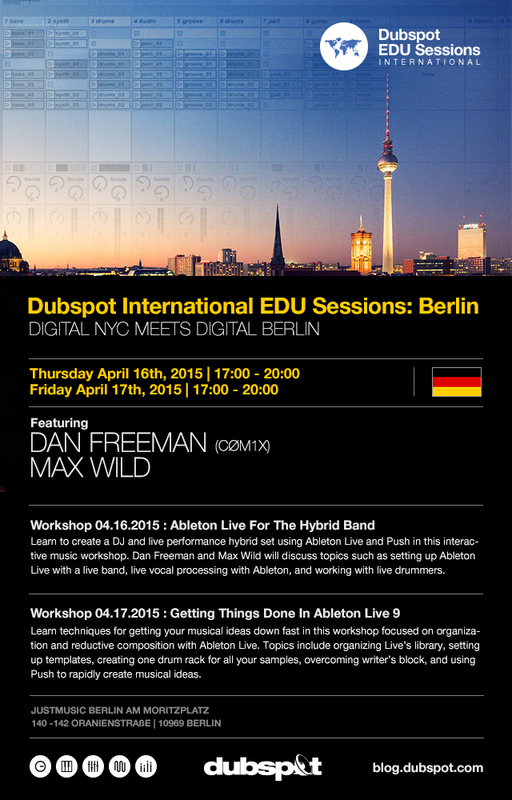 Dubspot heads to Berlin for a special Digital NYC meets Digital workshops on performance and production techniques using Ableton Live. Join Artist/Producer and Ableton Certified Trainer Dan FreeMan (CØm1x) and Saxophonist/Producer Max Wild during this two-day series of free workshops aimed to establish closer links between the digital communities of both cities. Learn performance and production techniques from New York City’s “hybrid band” scene, and catch an inside look at the modes of working with Ableton Live developed at Dubspot. Learn to create a DJ and live performance hybrid set using Ableton Live and Push in this interactive music workshop. Dan Freeman and Max Wild will discuss topics such as setting up Ableton Live with a live band, live vocal processing with Ableton, and working with live drummers. Learn techniques for getting your musical ideas down fast in this workshop focused on organization and reductive composition with Ableton Live. Topics include organizing Live’s library, setting up templates, creating one drum rack for all your samples, overcoming writer’s block, and using Push to rapidly create musical ideas. Dan FreeMan (CØm1x) is a producer/bassist and music technologist based in Brooklyn, New York. Originally from Boston, USA, Dan comes from a bicultural background: his mother is Nicaraguan and his father American, so he grew up exposed to a rich variety of music. He started training as a classical pianist at the age of four and switched to jazz bass at thirteen. After graduating from Harvard University, he came to New York to be a session bassist. As a bass player he has performed with such artists as Angelique Kidjo, and the B52’s and throughout North America, South America, and Europe in venues ranging from underground Brooklyn loft parties to Carnegie Hall. He also played keyboards for the RCA Records’ rock group Stellastarr*. In 2008, he formed the electrofunk digital music and art collective Comandante Zero (CØ). CØ developed techniques for fusing live acoustic instruments with laptops running Ableton Live and created their own unique hybrid set as well as serving as a backing band for various artists including Polina Goudieva and Virgin Records’ artist Xavier at such venues as L.A’s House Of Blues, Berlin’s Berghain, New York’s Webster Hall and Santiago’s PUMA Labs. They also worked with Grammy winning producer Bob Power on their first E.P ‘Slouching Towards Babylon’. Currently, Dan has a production studio in Gowanus, Brooklyn where he mixes, remixes and writes for film. He also performs a unique ‘live production’ solo set where he creates heavy electro funk grooves in real time using the Ableton PUSH instrument. Dan is an Ableton Live 8 and 9 Certified Trainer and instructor at New York City’s Dubspot where he teaches electronic music production. In his position as the head of Dubspot International he recently created the Dubspot International Network, an alliance of digital music schools worldwide. He has also organized presented and performed at events, festivals and universities worldwide including SXSW (Austin, TX), Harvard University (Cambridge, MA), Mexico City, Rio de Janeiro, Curitiba, Santiago (Chile), Copenhagen, and the University of Caldas (Colombia). He also hosts the Dubspot/New York City Ableton User Group. Saxophone innovator and producer Max Wild has been a forerunner on the Afrojazz scene in New York since commanding international attention with his ObliqSound release Tamba, which features Zimbabwean vocalists Chiwoniso and the late Sam Mtukudzi, as well as Wild’s allstar band from New York. Raised in Zimbabwe by German parents, and later moving to Berlin, London, and then New York, Wild was exposed to a broad spectrum of music from an early age. With credentials that range from performing with Grammy nominated jazz tenorist Mark Turner to recording with Afropop icon Oliver Mtukudzi, Wild started producing music as well as incorporating electronic elements into his live performances using Ableton Live. He has performed at major jazz and world music venues and festivals around the world such as Nuits d’Afrique Montreal, Celebrate Brooklyn New York, Harare International Festival of the Arts Zimbabwe, Maalmakula Festival Estonia, Ronnie Scott’s Jazz Club London UK, House on Fire Swaziland, and Music Meeting Holland. Wild is an accomplished educator and teaches music theory and eartraining at Manhattan School of Music Precollege as well as giving music workshops around the world. He holds a Bachelor of Music degree from London’s Guildhall School of Music and a Master of Music from Manhattan School of Music. In April 2012 he was recruited by Dubspot to teach Music Foundations.